Sweet Romance Reads: Looking for free e-books? If you're looking for free romance e-books, mark the 20th on your calendars! Every month, the ten authors of our next short story collection, Sweet Christmas Kisses 5, will tell you a bit about themselves and about the creation of the new short stories (coming out September 25th!). 2. Leave the number and the name of the author who should gift you a free e-book. This will automatically enter you in the drawing! We'll pick three winners in total, so you've got good chances to win! Sounds like fun, Beate! 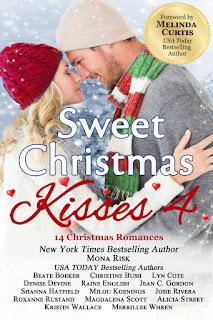 I wish you all good things with Sweet Christmas Kisses 5!! How exciting! Looking forward to it! Congrats! This bundle looks fun.